If you want to write a book—or if you’ve already written a book and want to become a bestselling author—this post is for you! It’s Cyber Monday in the United States and many online retailers are making available special discounts on their products. I also want to extend a very special offer to you for my new Get Published course. I released this audio program just a few months ago. I crammed my 30-plus years of industry experience into this practical 21-session course. 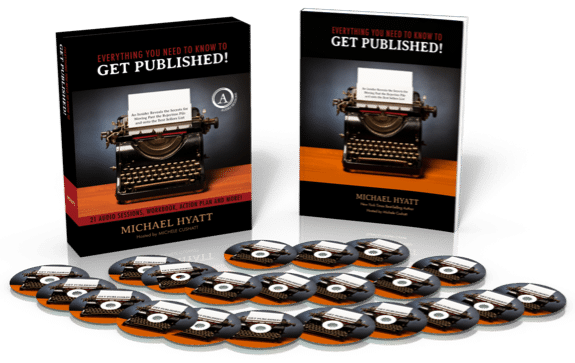 I designed it to teach you everything that you need to know to get published and become a bestselling author. For today only (November 26, 2012 until 11:59 p.m., CST) I’m offering Get Published for only $197. That’s $200 off the regular price of $397. It’s a one-day-only special for Cyber Monday. You can ORDER NOW and get instant access online. You can get all the details by clicking here. At 11:59 p.m. today (November 26th), I will raise the price back to the usual level. By the way, I’m so confident that Get Published is the best publishing program available any where, that I offer a no-questions-asked, 90-day money back guarantee. If you don’t find this program helpful and worth every penny you pay, I will promptly refund your money. No problem. No questions asked. You have my word on it. If you want to explore this course further, you can find a list of the benefits, along with a comprehensive outline here. See why more than 700 people have already purchased this program and are well on their way to publishing success. If you are serious about getting published, this is the program for you. This Cyber Monday special provides you with the opportunity to get it at an unbeatable price. Click here to learn more.